Got a question? Leave us a note and we'll get back to you as soon as possible. Need stronger parts? Get an Onyx Pro to get access to Fiberglass reinforcement. Need stiffer and lighter parts? 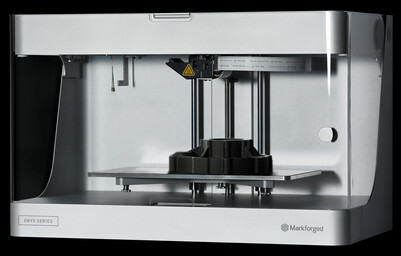 Get a Mark Two for access to Carbon Fiber reinforcement. Onyx printers' base material is a blend of nylon and chopped carbon for stronger and stiffer parts than plastics other printers use—and that stand up to corrosive chemicals common in manufacturing. Get started with the economical Onyx One or step up to the Onyx Pro to boost part strength 10x by embedding continuous fiberglass. Print Onyx Filament—a revolutionary material with beautiful surface finish, stiffness and temperature tolerance. No other 3D printer on the market is designed from the ground up—hardware, software, and materials—to uniquely create chopped carbon fiber parts. Every Onyx Series printer comes with a built-in touchscreen that makes it easy to connect to WIFI, start prints and manage your printer. 3D printing is as much about the software as it is about the unique technology of the printers. Eiger 3D printing software (included with every printer) is both powerful and easy to use in your browser, importing your drawing and slicing it for high performance printing.